But as the Shaolin monk pointed out, kung fu embodies much more than fighting. In fact any ability resulting from practice and cultivation could accurately be said to embody kung fu. There is a kung fu of dancing, painting, cooking, writing, acting, making good judgments, dealing with people, even governing. 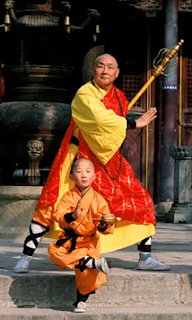 During the Song and Ming dynasties in China, the term kung fu was widely used by the neo-Confucians, the Daoists and Buddhists alike for the art of living one’s life in general, and they all unequivocally spoke of their teachings as different schools of kung fu. I was a philosophy major in college, I've dabbled in tai chi chuan, and have an enduring interest in Buddhist philosophy (though I'm not a Buddhist). I wish I could say I was some kind of expert in this field; however, it's mostly through two unaccredited schools that I received my training in kung fu philosophy: Shaw Brothers and Golden Harvest.